I slipped out quietly at about five, after attempting to stealthily wake my brother-in-law to no avail. Five was just a little too early for him, and a communication snafu the night before meant I would be doing another (in a very long run of) solo DIY trip – this time to Galveston Island. Meandering through the backroads of Tomball, I hit one of my turns and while I was waiting for the light to change, glanced over to my left to see the Wal-Mart parking lot churning with activity. Folks were jockeying for parking spaces on the outer fringes, and it looked as if the overflow was already parking on the grass. Black Friday. To me Black Friday is one of those days where each should be left to their own devices, be it football, shopping or fly fishing. Last year it was the Blue River – see “Blue on Black” for that Friday. The tradition isn’t that old, but it obviously has legs. Beside treasured family, I was leaving behind turkey, stuffing, pecan pie, chocolate pecan pie, pumpkin pie, pumpkin cheesecake pie, and this pink salad stuff that was to die for. Somehow I made it through Thanksgiving without the usual feeling of being taxidermied, it’s all about pacing yourself. Every trip to Galveston is an adventure since there is no one I know who knows Galveston Island. I headed up a back road – Ferry Road off Seawall Boulevard – until now not realizing the road I was looking for was 51st. street / Pelican Island bridge to Seawolf Park Boulevard. That’s why they invented co-pilots. I hit the ferry traffic, and knew without knowing how long the ferry would take to get across to the Bolivar Peninsula, that I had better drop back and regroup. The South Jetty was a place I was familiar with, and with the change of seasons, I speculated, there might be some fish moving there. I turned out of the ferry line and did a backtrack to Seawall Boulevard, and up to the jetties. To make a long story mercifully short, there wasn’t any catching going on on the jetties, which are still split in a place that looks enticing enough to drown a person, so I started back up the channel. I came upon a tidal pool that, in these minor tides, was holding a pretty consistent amount of water. It meandered way back in, but there was a concentration of two guys fishing the widest pool, just where it gives and receives the freshest water from the channel. Flounder have been in the Texas news lately as conservation efforts focus on increasing the population of fish all along the Texas coast. And to my two well placed eyes, flounder are just plain freaky fish. 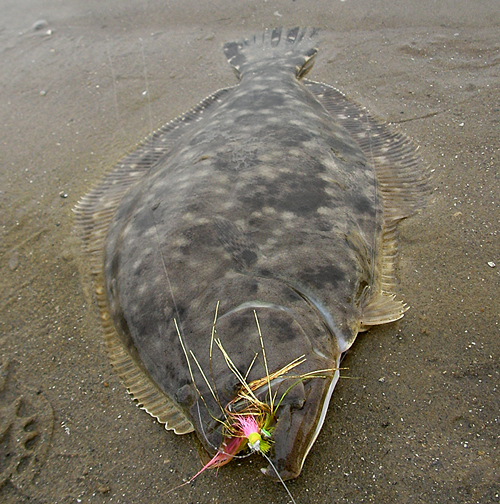 Plenty of southern flounder been caught on a fly rod, including a state record of 6.06 pounds by Robert Campbell, on November 10, 2005. The monster was 23.5 inches in length, and probably that big around. My only experience was seeing my Grandpa catch them off the Three Islands pier at night when telltale puffs of mud gave their presence away. If the speck action slowed that night, he would rig for flounder, and it was only a matter of time. Flounder, to our way of thinking, was a delicacy, and Grandma favored flounder over just about any fish I can remember. I walked up to one of the guys, who had just put a flounder on his stringer, and was back at his car re-rigging, “Fly fishing? They’re laying all along the other side over there. Here’s what you need!” He held out what I think is called a “Gulp” about three inches long in dayglow chartreuse. I held out my hand and he dropped the slimy thing in my palm. I didn’t exactly know what to say. “I don’t think I can cast that”, after a moment of hesitation. “Sure you can”, and he proceeded to cut with a degree of perfection, two feet of fresh mono, tie on a number 6 Mustad Treble and a funny looking thing on the other end. “What’s that, a weight” I asked? “Nooo, it’s a swivel!” He now knew I really didn’t know what was going on in his world. His knots were slow, deliberate and perfect. He handed me the leader and the “Gulp”. “But I don’t even know where to hook it.” “Here do it just like this”, and he showed me how it was done in his world. He handed me two more “Gulps” – one more chartreuse and a hot pink, and wished me luck. I decided to track across the surf at the shallow point to the other side. I just couldn’t bear to tell him that I wasn’t going to tie on a “Gulp” and treble hook, so I dug in and found an Ice Cream Clouser (#4) with heavy brass / green eyes and got after it. (I am pretty sure I saw the the tag “Ice Cream” for a pink-and-chartreuse Clouser) Once I got the sink, and pace correct, it was on. The retrieve is a slow one that just scrapes along the bottom, right across these fish – either annoying them, or enticing them into a strike. When they fight, it’s like a straight line pull down and away – away left, away right and way away. As more time went by, more anglers began arriving, either by sight of us, or by already knowing about this spot. It was quickly turning combat, and among the other anglers were, unfortunately, a few poachers. So, after catching about eight flounder in the 14 to 20 inch range, as well as a whiting and sand trout, it seemed like a good time to move on. Flounder were still being flopped onshore as I left, and as one guy was passing by, carrying a fish, in bent arm and tail dragging the ground, I couldn’t help but say “great fish”. He said, in broken english, “not that big, probably six-and-a-half”. I was amazed. “Let me see”, I said and whipped out my Boga. We lipped it and sure enough, “exactamente!” dead on 6.5 pounds. What a day. I had had enough and the whole poaching thing was starting to get my pressure up, so it was time to go look elsewhere. No other spot came close to the productivity of that spot, and nothing quite compares to Black Friday Fish – last year rainbow trout, this year flounder. Who knows what and where’s next? For those of you wondering what the new flounder regulations for Texas are you can find them here. Great shot! When all else fails – throw a Clouser!!! !